Made with healthy ingredients, these Buffalo Chicken Wings are as nutritious as they are delicious. Dip them in the Blue Cheese Dip for extra flavor. 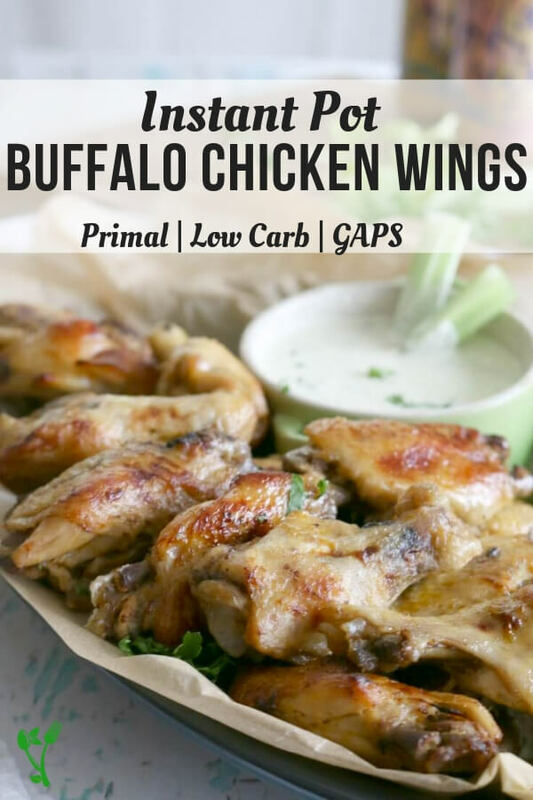 This low-carb recipe is also naturally Primal and GAPS diet compliant. I have to admit, when I first heard about the Instant Pot, I was skeptical. I just chalked up all the hype to a sly marketing trick because after all, pressure cookers have been around for a very long time. Nothing new there. Oh and also? They’re used as explosive devices. So there’s that. But then as I dug a little deeper, I realized this shiny gadget wasn’t just a pressure cooker. It also served as a slow cooker, a rice cooker and a cheesecake maker. Coincidently, this was around the time my slow cooker of 14 years had given up on me and I was in the market for a new one. Of course it made total sense to invest in this small kitchen appliance that can do the job of a pressure cooker and slow cooker. Since then, I actually acquired a second instant pot and an extra inner pot and an extra sealing ring. Yes, the Instant Pot has redeemed my home cook status on more than one occasion. It can cook frozen meats in under an hour, chili in 18 minutes, and the best hard-boiled eggs for the impatient egg peeler. I’ve yet to find something that the Instant Pot cannot make. Okay, steak. That’s meant to be slapped on a grill. But Instant Pot is so fabulously versatile. It makes breakfasts. Soups. Salads. In fact, during our total kitchen remodel last fall, I cooked 80% of our meals in the Instant Pot. The rest 20% was Chipotle. I became so comfortable with it that now that I do have a full kitchen, I still resort to my beloved pressure cooker. I cooked these wings in the pressure cooker and then drenched them in the hot buffalo sauce, which is by the way, refined sugar-free! Now I should note that this recipe does have a little bit of honey. However, dispersed throughout the entire 4 pounds of chicken wings, the total carb count comes incredibly low per serving size. If you are still uncomfortable with using honey as the sweetener in the recipe, feel free to substitute with your liquid sweetener of choice. But thanks to the honey, this recipe is also GAPS compliant (since honey is the only sweetener allowed on GAPS). 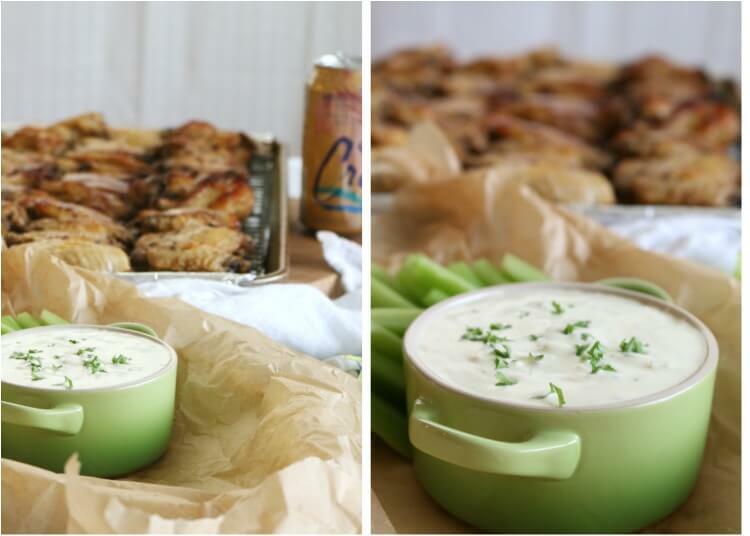 The Blue Cheese Dip is the perfect condiment for the wings. I find it odd that hot sauce and blue cheese would pair so well together, but they do. 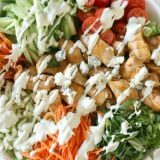 The perfect combination of blue cheese, sour cream, and mayo all blended with garlic and lemon is amazingly delicious. Instant Pot – The best pressure cooker on the market. Steamer Basket or Trivet that came with the pot – The basket does a better job of making sure the wings are not submerged in water. Tongs – To handle the hot chicken wings once they’re done cooking. Small Saucepan – I love this stainless steel for the Buffalo Sauce. Baking Sheet – You can line this with parchment paper or place a cooling rack directly in the sheet with foil underneath to catch all the juices. Small Bowl for making the Blue Cheese Dip. Ingredients for the wings are Hot Sauce, Pure Honey, Pastured Butter, Unrefined Salt. Mayonnaise for the Blue Cheese Dip can be found here or the recipe here. Pour 1 cup of water into the bottom of the stainless steel inner pot. Set the steamer basket or trivet in the pot and place chicken wings in single layer, as much as possible (some pieces will overlap, that's okay, but try to space them out evenly). Press Manual and set time to 10 minutes on high pressure. When the 10 minutes is up, press Cancel and let the pot naturally release pressure (this should take approximately 10-15 minutes). Meanwhile, prepare the Buffalo Sauce by heating hot sauce, honey, butter and salt in a small saucepan over medium heat. When Instant Pot has depressurized and the silver dial (safety pin) dropped, carefully open the lid. 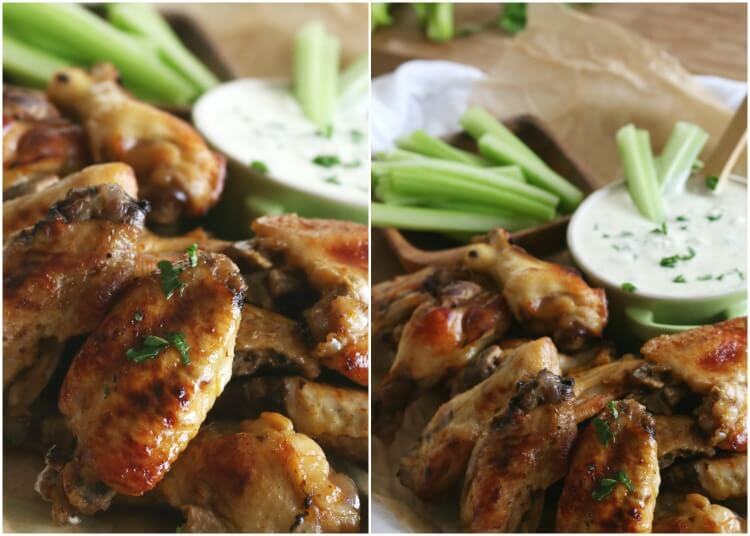 Remove chicken wings and pat dry with paper towels. Directly on a baking sheet, pour buffalo sauce over the chicken wings and toss gently to combine. 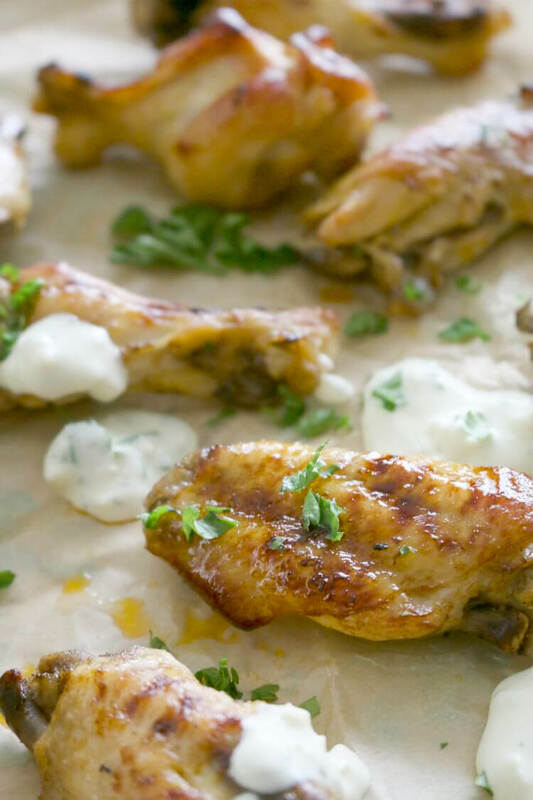 Spread the wings in a single layer on the sheet and place under the broiler for 5 minutes or until browned. 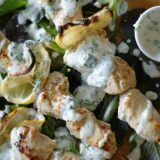 While chicken is broiling, combine crumbled blue cheese, yogurt, mayonnaise, garlic and lemon. Salt and pepper to taste if desired. 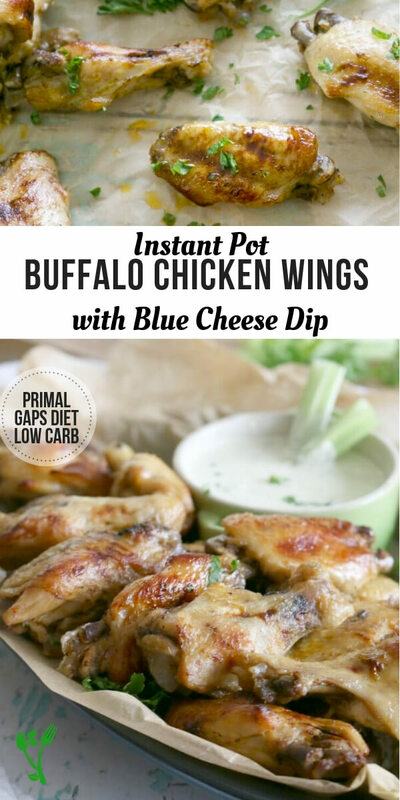 Enjoy buffalo wings by dipping them into the blue cheese dip. Serve alongside with some celery sticks and carrots. Need More Instant Pot Meals? Now this is how to eat chicken wings! I’m here for this!! Haha. I have to laugh because I buy kitchen gadgets like some women buy shoes. Can’t have too many! I love the ease and look of these wings and their dipping partner. a will do. 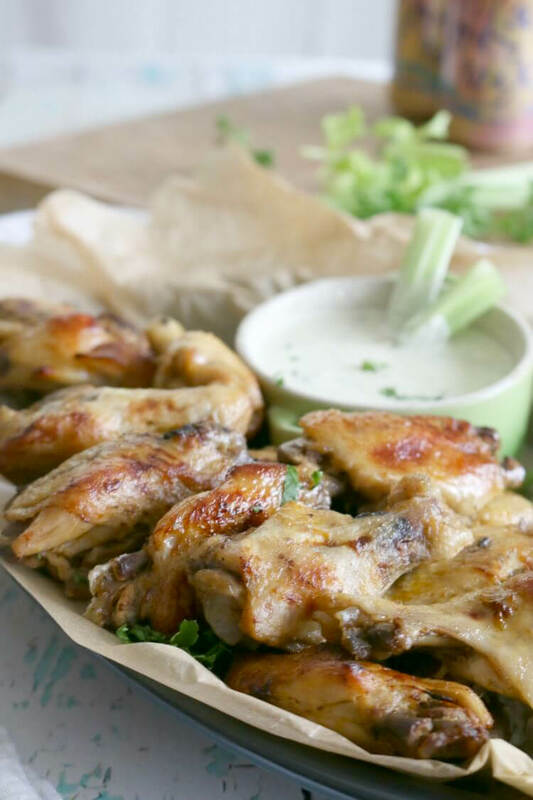 I love blue cheese sauce, you don’t get it here in Europe very often, bet my boyfriend would love these chicken wings! Oh my these sound absolutely delicious. That blue cheese dip is calling my name!! These look delicious! I haven’t got an instant pot but I keep seeing so many amazing recipes to make in it that I am seriously tempted! Hope you get one soon! You won’t regret it! You should try making them in the IP. Way easy!! Oh my gosh I could easily gobble up 50 of those! I wish I had some of these right now! We love chicken wings, Tiny Love loves thinks they’re so much fun to eat. I love that you make these in the Instant Pot! I think it’s so adorable when little ones eat chicken wings. Excited to try this in my new Instant Pot! Oh yay! So happy you got one now. Enjoy!! These look so good and so easy to make with an instant pot! 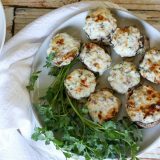 I love that you included the traditional blue cheese with this recipe. Delicious! Luci’s Morsels | fashion. food. frivolity. 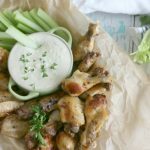 I didn’t think about using an Instant Pot to make wings. These look fabulous! I really need to go out and get one. Instant Pot makes it so much easier!! You won’t regret getting one! So happy to hear I’m not the only one who prefers kitchen gadgets over shoes!?. Received my Instant Pot for Christmas & I am totally obsessed. Hubs hasn’t eaten this good in ten years. He’s to the point of yelling, STOP already, we have enough leftovers to feed the neighborhood! Hosting a Panthers playoff game on Sunday and making these puppies. One question, do the wings go in frozen or thawed? Hi Delilah! Happy to hear you’re enjoying your Instant Pot. I put them in thawed but frozen will work too. Just account for the extra time for them to defrost in the pressure cooker. 🙂 Enjoy! !